Next to the wastewater treatment plant in the small town of Beacon Falls, Connecticut, lies a 2-acre plot of surplus land. Previously used to store soil and gravel for the town garage, the property is now the site of a solar brightfield capable of generating 351.8 kW-DC of electricity. The Regional Food Bank of Northeastern New York recently installed hundreds of solar panels on top of its Albany warehouse. The move is expected to save more than $500,000 over the next 25 years. The New York State Energy Research and Development Authority pitched in $350,000 for the project. This comes as the facility undergoes an expansion worth more than $2 million. “The less we spent on energy, the more we have available to invest in acquiring more food and distributing that food out to our member agencies,” said Mark Quandt, executive director of the food bank. William Jordan, CEO of Jordan Energy and Food Enterprises, provided consulting and helped to secure state funding. “So a lot of extra dollars will be able to be used to address the core mission of the food bank: feeding hungry people,” said Jordan. The panels are expected to generate about 60 percent of the electricity used at the facility, along with another warehouse in the Hudson Valley. NYSERDA and Regional Food Bank of Northeastern New York Announce Completion of Solar Installations Saving Food Bank $520,000 Over a 25-Year Period. Projects Help Food Bank Facilities in Albany and Cornwall-on-Hudson Cut Greenhouse Gas Emissions by 7,600 tons and Support New York State’s Goals to Cut Statewide Emissions 40% by 2030 from 1990 Levels. The New York State Energy Research and Development Authority (NYSERDA) and Regional Food Bank of Northeastern New York today announced that two newly completed solar installations atop the Food Bank’s warehouse facilities in Albany and the Village of Cornwall-on-Hudson, in Orange County, will lead to estimated savings of approximately $520,000 over a 25-year power purchase agreement (PPA) and elimination of approximately 7,600 tons of greenhouse gas emissions, or the equivalent of taking 58 cars off the road during that period. The installations have also been a catalyst for increasing awareness of opportunities available to the Food Bank to lower its utility bills through changes to its electricity-use habits. NY-Sun, a statewide program of Governor Andrew M. Cuomo, supported the two solar projects with a $353,000 grant from NYSERDA, offsetting a portion of the nearly $2 million cost. Expanded solar power supplies is a key facet of the Governor’s comprehensive energy strategy—Reforming the Energy Vision (REV)—to build a cleaner, more resilient and affordable energy system for all New Yorkers. REV supports widespread deployment of clean renewable power generation, and giving electricity customers new opportunities in determining how their electricity is generated and for lowering their utility bills. The state’s Clean Energy Standard calls for 50 percent of the electricity in New York to come from renewable resources by 2030. Distributed generation facilities like those at the Regional Food Bank, involving electricity production close to end users of power, will be an essential element to success in meeting the State’s goals, including reducing statewide greenhouse gas emissions by 40 percent, from 1990 levels. The installations at the two Regional Food Bank facilities are comprised of a total of 2,673 solar panels and expected to combine for approximately 973,000 kilowatt-hours of annual generation, to meet approximately 60 percent of the facilities’ electricity needs. That amount of solar power would be equal to meeting the electricity requirements of 135 average-sized homes. A significant portion of the Food Bank’s utility bills stems from the energy-intensive refrigeration that its warehouse facilities rely upon for the large donations of food that it collects for the disadvantaged. The solar installations will lessen those costs in replacing higher priced electricity from the power grid and are leading to even greater savings by allowing the Food Bank warehouses to stagger the recharging schedule for their battery-powered forklifts. In the past, the warehouses did all the recharging of this equipment at one time, resulting in higher demand charges on their electric bills. The Regional Food Bank’s solar installations are located at 965 Albany Shaker Road in Albany, and 195 Hudson Street in Cornwall-on-Hudson. 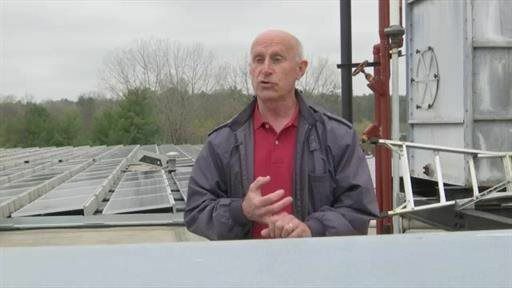 Dynamic Energy, a New York solar developer with offices in Saratoga Springs, designed and built the two solar projects, completing them in less than six months. At the end of the 25-year PPA, the ownership of the solar installations will be transferred to the Regional Food Bank, at which point the electricity from the solar panels will be free, for further cost savings on the Food Bank’s overall electricity bills. Under NY-Sun, New York State has greatly advanced its amount of state-supported solar energy. Since December 2011, solar growth has increased nearly 800 percent, with nearly 65,000 projects installed through December 2016. As of the end of the year, the projects amounted to nearly 744 megawatts of generating capacity. New York now has more than 8,000 people engaged in solar jobs in various parts of the state.